Speech introductions are often an afterthought, hastily thrown together at the last second by someone with little knowledge of the speaker, their speech, or the value for the audience. And yet, speech introductions are critical to the success of a speech. While a strong speech opening is vital, nothing helps establish a speaker’s credibility more than a carefully-crafted and well-delivered introduction. This article gives you a series of practical tips for how to introduce a speaker to position them with the best possible chance to succeed. 1. Answer three core questions. When you are introducing a speaker, your primary goal is to prepare the audience and get them excited for what they are about to hear. Why is this topic important for this audience? Why is the speaker qualified to deliver this talk? By addressing these three questions, you’ve given the audience a motivation for listening (the topic is important to them), and you’ve reinforced the speaker’s credibility. 2. Prepare and practice adequately. Thoughts like that lead to stumbling, bumbling, off-the-cuff introductions which undermine your credibility and the credibility of the speaker. 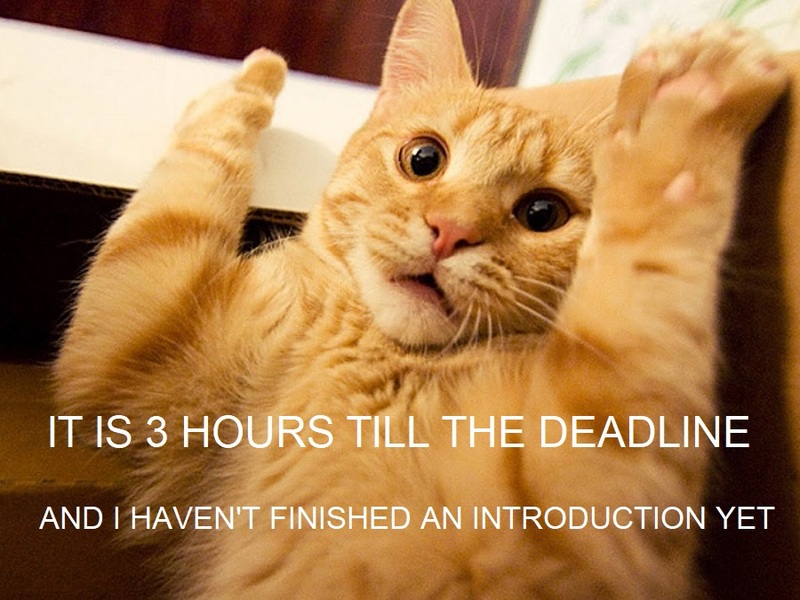 You should write out (and edit) the full introduction, check it with the speaker, and practice it several times. 3. Memorize it, or minimize your notes. 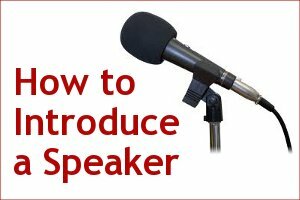 Try to memorize the introduction; speaking without notes will add to your authority, and the audience will put more weight in your recommendation (that is, to listen to this speaker). If you are unable to memorize the entire introduction, then use as few notes as you can. Be sure you can you deliver the last sentence of your introduction without notes as this will maximize momentum for the speaker. 4. Be positive and enthusiastic. The audience takes cues from you. If you seem disinterested, they will be disinterested. If you are (genuinely) positive and enthusiastic, they will be too. Your choice of words, voice, gestures, and facial expressions should all convey enthusiasm. So, how do you ensure you are enthusiastic? 5. Get to know the speaker. It is difficult to get the audience excited about the speaker if you aren’t excited yourself. If the speaker is previously unknown to you — for example, suppose you’ve volunteered to introduce speakers at a large industry event — your introduction may lack sincerity. So, get to know the speaker. Google them. Talk with them. Ask others about them. Research the speaker and their expertise until you are excited by the opportunity to introduce them. A sure way to undermine your own credibility and that of the speaker is to mispronounce their name, the title of their presentation, or any other key terms. Being accurate is as important as correct pronunciation, perhaps more so. Make sure you know the precise years, facts, or details. If you make factual errors, many speakers will feel an irresistible compulsion to correct you. This is a lousy way for them to begin their speech, and will almost certainly kill their momentum. 8. Don’t alter the speech title. Many speakers craft their presentation title very carefully, and the words matter to them. The title may be a phrase they want the audience to remember, it may reflect language used on accompanying slides, or it may be a humorous play on words. In most circumstances, no. Your objective is to get the audience excited about the topic and the speaker, and this is not the time to tell humorous anecdotes about the speaker. Save those for a roast! There are exceptions (as there are to all public speaking advice), and you’ll have to use your judgment. If this speech is part of a longer event, and the preceding talk has been particularly sad or low on energy, then it may help to lift the spirits of the audience. If you need to do this, do it early in your introduction, and then move on to the more thought-provoking content leading to your climax. 10. Don’t give an outline of the speech. I was once introduced by someone who had seen a longer presentation I gave on the same topic two years prior. Not only did they ignore the introduction I had written for them, but they gave a detailed outline of my whole talk, including which parts were their favorites! Unfortunately, my outline had changed substantially, and they had created unreasonable expectations and sabotaged my talk. Avoid undermining the speaker by giving too many details about the speech, telling anecdotes from their speech, or making promises about details in their presentation. It is the speaker’s job to decide how and when they reveal their outline. Keep your introduction at a high level, unless they have specifically asked you to do otherwise. 11. Stick to relevant expertise of the speaker. One very common mistake is to recite a lengthy list of biographical details (education, awards, former job titles, publications, etc.) which may or may not be relevant to the topic being presented. This is especially common at academic conferences. Our speaker grew up in Seattle and graduated at the top of her mechanical engineering class at Carnegie Mellon University. She went on to earn a Master’s Degree from Duke University, and a Ph.D. in Computer Science from Harvard. She is a member of the Automotive Engineers Association, and a two-time recipient of the Stone Award for Distinguished Linguistics Research. She was previously the Director of Research at Hasbro, and is currently the CEO for the Miami Dolphins. A much better introduction would touch on how many years the speaker had been building shaker furniture, whether she had been trained or self-taught, and that she had written a book on this topic. Okay, maybe that example was a bit extreme. But, even if the speaker has a lengthy list of biographical details that are related to her talk, there’s no need to recite them all. Pick a small number (about three) that are most relevant — usually the most recent details. Why not give all the details? Long introductions are boring. Nobody attends an event to listen to the introducer go on and on. Long introductions are pompous. Reciting dozens of professional accolades gives the impression that the speaker cares only about himself and his ego. Keep your introduction just long enough to accomplish your goals:  what’s the topic,  why does it matter, and  why is the speaker credible? I’m a big fan of short introductions in just about all situations. Sixty or ninety seconds is usually ample time. For really long presentations (e.g. keynote addresses lasting an hour or more), then two or three minutes may be warranted. How many times have you heard: “This speaker needs no introduction…” ? While the speaker may indeed be well-known to the audience, nearly every speech benefits from a brief introduction. Your introduction should get the audience excited about the presentation, but don’t take it too far. For example, it is reasonable to claim that the presentation will help the audience solve a business problem, save time, or understand the complexities of tax policy. But, it doesn’t help anyone to claim that “this presentation will solve all your problems“, or that it is “the best presentation you’ll ever hear“, or even that “you’ll be amazed by what you are about to hear“. Lofty expectations will actually have a detrimental effect, because the audience will feel challenged to prove you wrong. 15. Build to a climax. Your vocal delivery (strength and volume) should build toward the end of your introduction. (Keep it reasonable… there’s no need to yell.) By doing so, the audience will be compelled to welcome the speaker with loud applause. Ladies and gentlemen, please join me in welcoming our guest speaker, Donna Primeau! 16. Ensure a smooth transition. Know where the speaker will be as you speak your last words so that you can turn in that direction to greet them. Etiquette dictates that you should wait for them to come to you (e.g. on the stage, or at the lectern) and then shake hands before you leave. Shaking hands is a symbolic gesture that indicates you are “handing the floor” to them. Occasionally, the speaker may have a special entrance planned. (e.g. entrance music, a staged stunt, something with a prop) Make sure you ask the speaker about this, and do whatever you can to support them in a successful entrance. What tips can you share for great introductions? What introduction blunders drive you crazy? How long should introductions be? Please share your thoughts in the article comments.